Millennials may be a young generation with death the last thing on their minds, but they also need estate planning advice. Millennials are a loosely defined group of people born between approximately 1981 to 1996, some of whom have garnered a notorious reputation for departing from social norms and being social media obsessed. As millennials enter the workforce and begin acquiring their own assets, it is important to turn our mind to the aging population and the significant wealth transfer by baby boomers to millennials over the next several decades. In preparation, the younger generation should consider preparing a will, giving careful consideration to who they wish to benefit and taking steps to protect family wealth. Not only is succession planning important, a will can clearly reflect one’s intentions and alleviates stress for families if an unexpected death occurs. To ensure there are no issues with access and management, maintaining an accessible account and password list is helpful. It is also important to include a specific designation regarding digital assets and accounts in their power of attorney for property and will to provide the attorney or executor with management power. Incapacity planning is also key to the estate planning process. As a young healthy individual in their 20s, incapacity is not top of mind for the average millennial, but accidents or unexpected illness do happen. Having the freedom to appoint their chosen attorney and also making it easier on their family by preventing a costly guardianship application to the court, is important. Powers of attorney for property and personal care should not be overlooked. By the time they become necessary, it may be too late. Research conducted by BT Financial group suggests millennials are far more confident than the broader population about money, with almost three out of four saying they are optimistic about their future financial position. Curiously, this is despite two out of five of that group saying it’s either “difficult” or “very difficult” to meet their necessary cost of living expenses, including housing, electricity, health care and transport, right now. Of course by virtue of their age, millennials have their entire lives ahead of them to earn their financial freedom. But they are also on the cusp of extraordinary change in the workforce. The casualisation of work and the rise of the gig economy hardly deliver the stability and financial security that full-time employment can. Combined with rising living costs, young Australians could readily be forgiven for harbouring some fears about ever achieving financial freedom. It’s a good idea to translate that optimism into being prepared for the future. 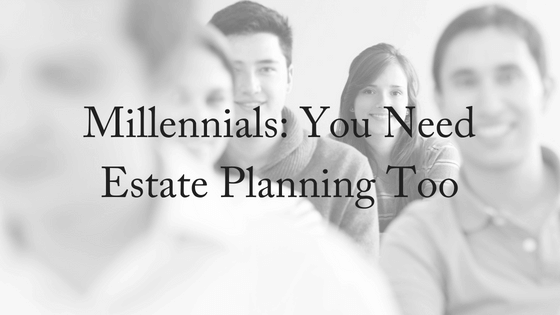 So when should millennials organise their estate planning? What most people also don’t know is that the event of getting married will invalidate any former Will that you or your partner may have had. It’s never too early or too late to consider your estate planning. For a FREE, 10-minute phone consultation, contact us today.